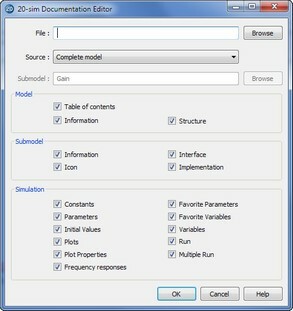 The Documentation Editor can be open from the File menu in the 20-sim Editor by clicking Document. The Document Editor can be used to generate an html document that can be used for Word Processors and Presentation software. The Document Editor will generate an html document that is fully hyperlinked. From a table of contents you can click to go to the desired part of the document. You can also click in pictures to go to the desired submodels. • File: Select the output file. • Source: Select the whole model or parts of it. • Submodel: If documentation of a part of the model should be documented, select the desired submodel. • Table of Contents: Select this option to start the document with a table of contents. • Information: Information on the creation date, user, file location etc. • Structure: The model hierarchy (list of all submodels, their submodels etc.). • Icon: The picture of the submodel icon. • Interface: The inputs, outputs and ports. • Implementation: The model implementation with equations at the lowest level. • Constants: List of the constants that are used in the model. • Parameters: List of the parameters that are used in the model. • Initial Values: List of the starting values of the states of the model. • Plots: Show pictures of the plots. • Plot Properties: Show the plot settings. • Frequency Response: Show the frequency responses. • Favorite Parameters: List of the favorite parameters that are used in the model. • Favorite Variables: List of the favorite variables. • Variables: List of the variables. • Run: list of the run settings. • Multiple Run: List of the multiple run settings.